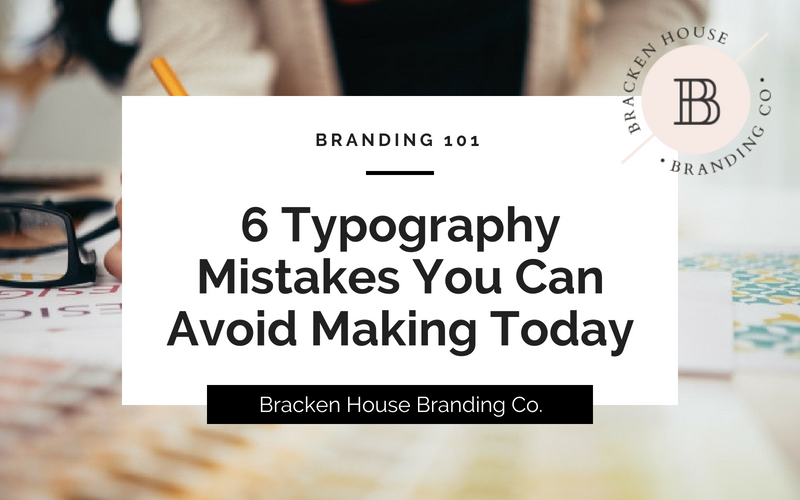 6 Typography Mistakes You Can Avoid Making Today - Bracken House Branding Co.
Typography seems so simple and straightforward. Choose a few fonts you love, and start creating… Right? Wrong! Typography is an art, and getting it right is one of the most crucial elements of good design. I realize that not everyone is a designer, so I’m sharing a few of the most common typography pitfalls that you can quickly pick up on, and start avoiding today! While many professional brand stylists will give you a 100 bullet point checklist of things to avoid doing with your type, I’m keeping it simple and easy for you – here are my top six personal pet peeves when it comes to type. 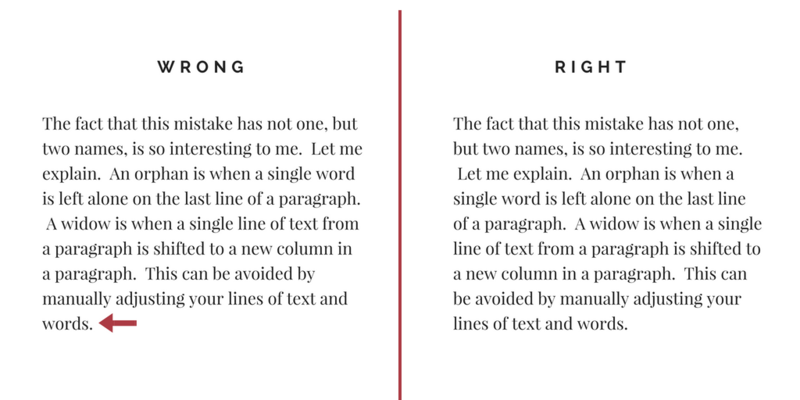 Six typography pitfalls you can avoid making today! 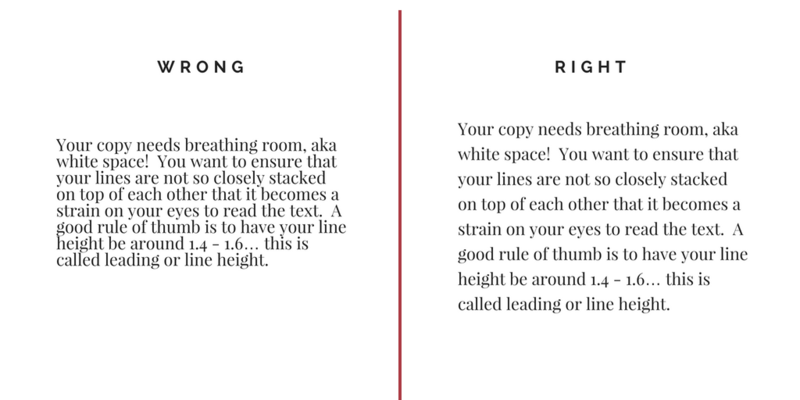 Your copy needs breathing room, aka white space. You want to ensure that your lines are not so closely stacked on top of each other that it becomes a strain on your eyes to read the text. A good rule of thumb is to have your line height be around 1.4 – 1.6… This is called leading. You also want to ensure that you give your text some breathing room around the sides, top and bottom – we call this padding. 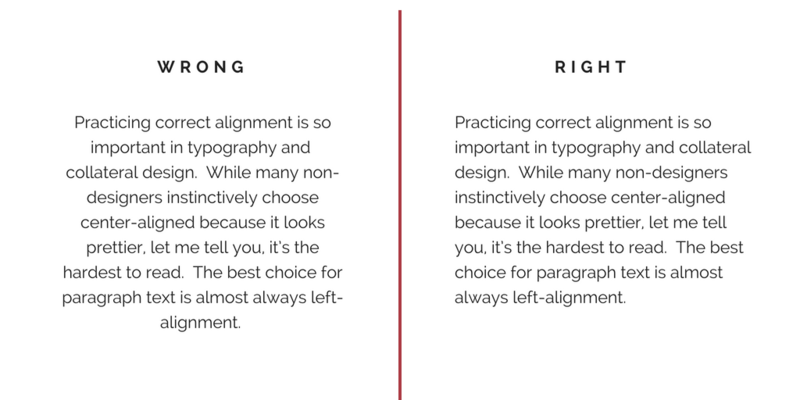 Practicing correct alignment is so important in typography and collateral design. While many non-designers instinctively choose center-aligned because it looks prettier, it’s actually the hardest to read. The best choice for paragraph text is almost always left-alignment. Save the pretty center alignment for quotes and headlines. Fancy fonts are for short lines of text, and should only be used as an accent font, to create visual interest and add a bit of personality! This just looks bad, so let’s all agree to avoid doing it. 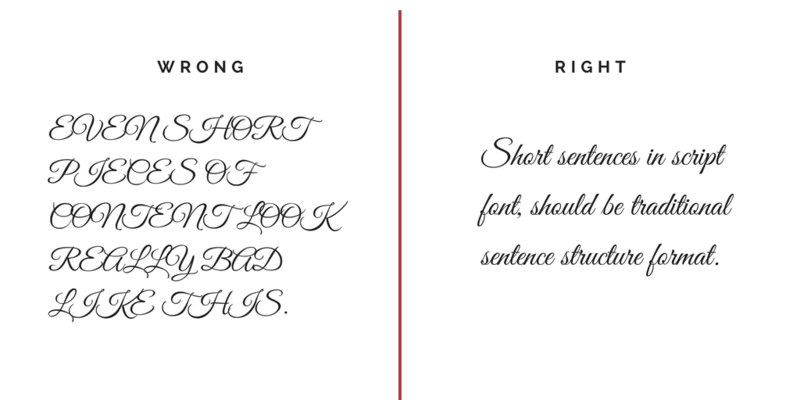 Script fonts are meant to be written out as you would handwrite something in cursive. You wouldn’t handwrite all uppercase script letters, so there’s no place for it in the digital world either. When using a script font, stick to the traditional sentence structure, with an uppercase first letter, and lowercase for the rest. Letter-spacing or kerning, also has no part in script fonts. Nothing drives me crazier than seeing a piece of content or collateral that is jam-packed with too many fonts. I get it, it’s really hard to pick just one, but you do need to pick. I always recommend two main fonts, and one accent font, used sparingly for visual interest and personality. 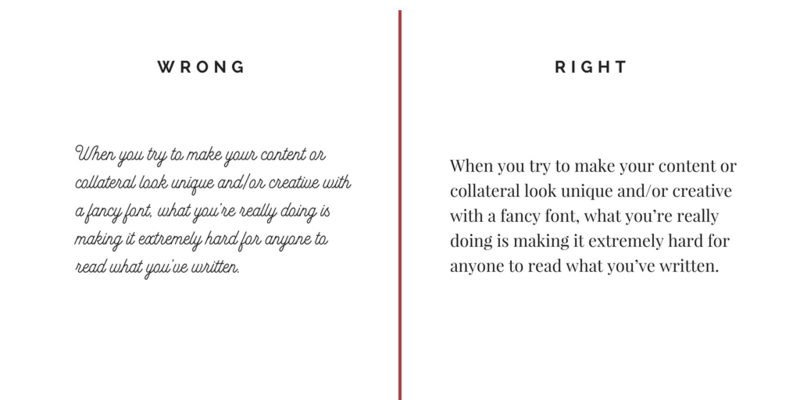 Your two main fonts should balance each other well with contrast, yet compliment each other. 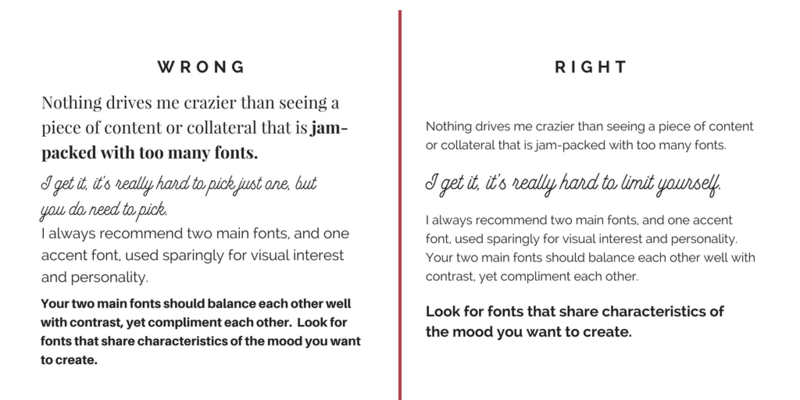 Look for fonts that share characteristics of the mood you want to create. The fact that this mistake has not one, but two names, is so interesting to me. Let me explain. An orphan is when a single word is left alone on the last line of a paragraph. A widow is when a single line of text from a paragraph is shifted to a new column in a paragraph. This can be avoided by manually adjusting your lines of text and words! Pro Tip – to wrap a word to the next line, simple hold down ‘Shift + Enter’ and you’ll avoid that awkward double-spacing effect that often occurs when you just hit Enter. Paying attention to these 6 common mistakes (and avoiding them) will instantly improve your overall brand image! For more branding tips and advice, please join me inside of my FREE Facebook Group, DIY Design Alliance! Let's discuss your design project! If you’re ready to step away from mediocrity, and turn your long-time dreams into a reality, or make some massive shifts in how you present your business to the world, then we need to chat! 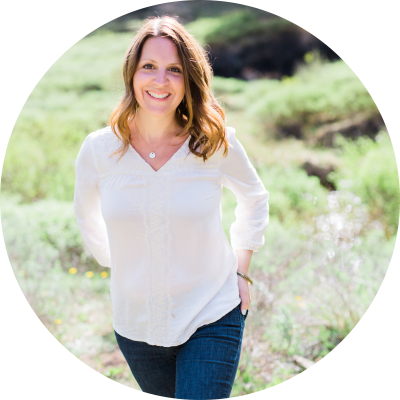 Click below to get started on the process to revealing your authentic truth and getting noticed, so you can start making a profit, today!